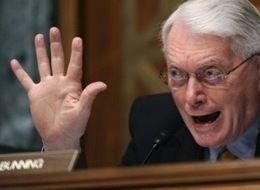 Legendary Kentucky-fried anger ball and ruthless pariah, Sen. Jim Bunning took his furious, red-faced jihad against poor people to the Hart Senate Office Building where he showed all the poise and tact of a rogue hippopotamus under duress when asked a simple question about his own rogue, one-man crusade against extending unemployment benefits to poor, pathetic Americans who can’t even hold onto a job. Losers! Asked by ABC News reporters to at least attempt to explain his bizarre, solo decision to block a bill aimed at alleviated the suffering of those hardest hit by the recession, Jim Bunning acted just they way you’d expect a washed-up MLB pitcher turned U.S. Senator to act if he was beaned in the head one too many times by one of his own legendary fastballs: totally insane. Refusing to answer a single question about his one-man filibuster of a bill extending health and unemployment benefits to struggling Americans, like whether he gives two sh*ts about those losing their benefits as a result of his wise choice, Bunning instead chose the high road by giving reporters the silent treatment. This is of course what normal elected officials to the world’s greatest legislative body do when asked simple questions about their legislative actions. They also have near mental breakdowns when members of the terrible mainstream media or other subhuman invaders try to weasel their way into fancy contraptions that move vertically to deliver very important people and/or cargo from one floor to another, all without having to take a step. Like magic! Like when ABC correspondent Jon Karl dared go near the precious Hart Senate office building up-and-down contraption thingamajig Bunning was already occupying. Same for the sweet li’l lady thinking her tight behind and flowing blonde locks might help soften Jim Bunning’s industrial grade steel heart. That’s where all the cranky old baseball pitchers go to spend their twilight years, making other people’s lives as miserable as their own. It’s practically a GOP tradition! Nor apparently does being mentally stable enough to serve in the U.S. Senate, as Bunning was more than happy to demonstrate to the good folks who he continues to gleefully screw over in their darkest time of need. Send Mr. Bunning to ye olde big elevator in the sky? “We need this to end. Debate big differences. Disagree. Use the filibuster when big matters of principle hang in the balance – and sometimes they do. But at the end of the day, Washington has to function – people are counting on it,” Kerry said. Lol. So true, what do you think Jim Bunning’s there for? Comedic effect? His breathtaking beauty? Or maybe they’re just trying to fill their quota for deranged, racist, old white men with the necessary warrior heart and athletic prowess to throw wicked, two-seam fastballs at poor struggling Americans who can’t even afford a variety bucket of the Colonel’s original recipe.